Moving Insurance may be available through your homeowner's insurance. If you have no homeowner's policy or it offers inadequate protection you can research other insurance carriers through your state's Department of Insurance. Get a quote from at least two insurance companies. Check insurance reputation and financial stability, as well as their claims payment record. 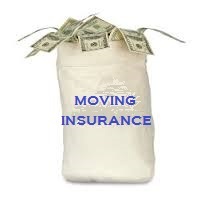 You also have to make sure that the insurance company will be able to insure the moving company of your choice. Minimum and Maximum policy values. VALUATION PROTECTION is not an insurance policy, it is your mover's tariff liability over your shipment. There are three levels of valuation protection that are offered to shippers. Mover's Contract also known as a bill of lading has a section dedicated to valuation options. Shipper must sign that section, choosing the protection. Shippers have until the movers begin loading to select coverage, once the move commenced no changes to selected valuation protection may be made. Basic: 60 cents/lb. No cost. Actual Cash Value Rate: $1.25 per $100 of insurance coverage. You must also select the value for the remainder of shipment to be delivered. Actual Cash Value protection insures recovery at the actual cash value (i.e. fair market values) of your lost or damaged item(s), up to the value you declare. The mover may charge for this protection. Full Value protection insures recovery at the full value (i.e. replacement value) of your lost or damaged items(s), up to the total value protection. You are responsible for deductibles unless an item is lost by the mover. Here is what it looks like on most contracts.